Facebook data centers are located in the Arctic region. Microsoft has an underwater data center. These are not the only data centers dotting the globe in very interesting locations as the online revolution continues to take shape. A common factor about these installations is that they are after cold climates that offer reliable and cost-effective cooling systems. In the Arctic region, the climate is so cold that a data center could simply rely on cold water or air for cooling. While these solutions are popular, the main concern remains on what the future of the best data center cooling systems looks like, especially for facilities in warmer climates. The common goal is to cool the data center system, but the specific method chosen is driven by the preferences of operator, owner or developer. This brings us to factors such as water use, scalability, initial cost, operating cost, flexibility and maintenance. Modern data cooling technologies have higher operating efficiencies, which save on both energy and operating cost. As these factors are the definitions for data cooling designs for the next online revolution, the aim is to choose a system that is most efficient and more robust. ARANER is striving to offer cooling solutions that combine these factors to the highest degree. Presently, two data center cooling methods are most prevalent: Liquid Cooling and Air Cooling. When computers first made it to the scene, water was the first choice cooling medium. However, this was to change with the improvement of electronics and reduction in size of computers. In an unlikely twist that has been spurred by increase in energy prices and electronic density, Water Cooling seems to be emerging again. The cooling infrastructure forms a huge expense in a data center. There is no better way of controlling operating costs than reducing this expense. The next online revolution is sure to draw monumental amounts of power considering that within a span of one decade, a High-Performance Computing (HPC) data center has increased its demand for power ten times. It is possible to direct cooling to specific areas, most importantly the critical ones e.g. the processors. Contrast that with air, a medium that has trouble traveling through servers. Sometimes, only huge volumes of air blown will ensure that the right components receive a reasonable amount of cooling. What this means is that data center managers have many options to consider, something that makes liquid cooling more attractive than water-cooling. A data center consumes a lot of energy, a bulk of which goes into cooling applications. That explains why every facility should focus its energy-saving efforts on data center cooling systems. Unless the data center is in a Swiss like climate, free cold air is impractical. Modern data centers demand liquid cooling solutions. Water-cooling in the form of district cooling is worth trying, if it is available in your area. A production facility produces chilled water that is transported via a pipe network to users. ARANER has successfully implemented this technology in different organizations-universities, hospitals, office complexes, new urban developments and so on. As data centers continue to be major consumers of electricity, the next online revolution can rely on the sustainability of a low cost and highly efficient data center cooling systems. With the change from air cooling to liquid cooling happening, there is always need for understanding of all the factors involved. 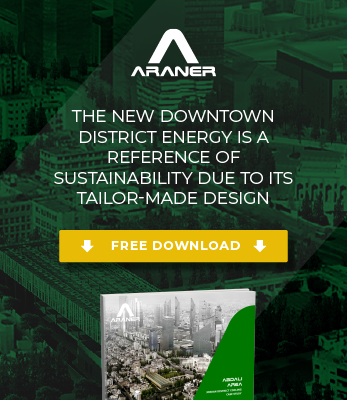 ARANER- an undisputed leader in large-scale cooling solutions- can offer thorough guidance through the installation process of the best data center cooling system. Contact us today for more. Good and nice article. Very helpful post.